This was the sight at most grocery and drug stores since yesterday. 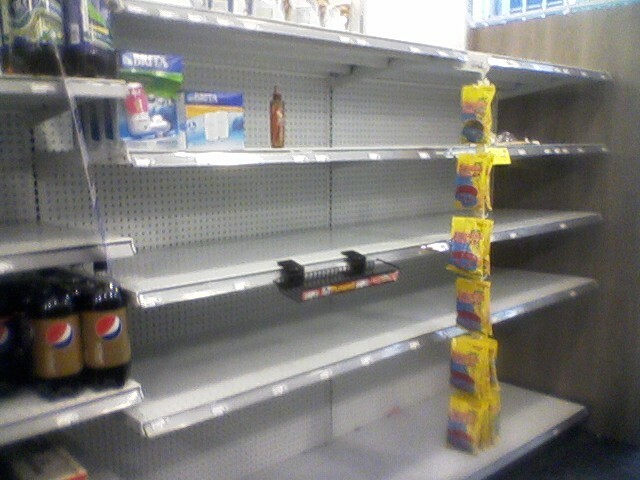 A lot of people have been stocking up on food and bottled water, preparing for Hurricane Irene's unwelcome arrival. The responses to Irene are as diverse as New York itself. There are definitely people who think Irene is going to be nothing but heavy rain. With these folks, there's a definite bravado and a sense that they'e not afraid or concerned about anything. Some may take the opportunity to run in Central Park tonight just to say they did. Then there are New Yorkers that are freaking out. When you see them at the grocery store, it looks like they're stocking up for a month. Some residents also have taped up their windows, even though they say Irene will only be a Category I by the time she comes through the city. But most people are somewhere in between. Cautious, taking steps to prepare, but not overly anxious about it. Carol and I tried to take Sophia outside today as much as possible since tomorrow we'll likely be indoors. Most restaurants were shut down today, some grocery stores stayed open, but many places have shut down by now to allow employees to get home safely. The subways and trains have been shut down since noon. Duane Reade across the street is still open, and the local Irish pub - Pig 'n Whistle - around the corner will be open tonight. I'll try to update the blog tomorrow.